Antonio Conte has warned Manchester United he is “stronger and hungrier” after Chelsea’s setback in Rome. Mourinho and Conte The Blues lost control of their Champions League group with a 3-0 defeat to Roma at the Stadio Olimpico on Tuesday and have now failed to win four of their last seven matches in all competitions. Chelsea return to domestic action against United today targeting a third straight Premier League win following damaging defeats to Crystal Palace and Manchester City either side of the October international break. 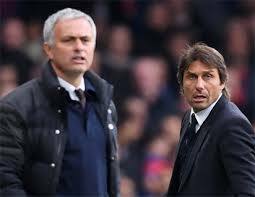 Conte’s men sit nine points off Premier League leaders City and know defeat against United would significantly dent any realistic hopes of a successful title defence. “Those who know me very well, know that I don’t like to lose and that I need a bit of time to digest this loss,” said Conte when asked about Chelsea’s loss in the Italian capital.